I went through a phase of craving bubble tea. Bubble tea is a tea-based drink very popular in Taiwan and its Asian neighbours (there is a milk tea/bubble tea revolution in the Philippines, if my friends’ Facebook and Twitter photos are to be believed!). If you’ve never had bubble tea (where have you been? ), think your typical cup of tea mixed with a milk shake (it’s served cold) with tapioca pearls sucked through a big, fat straw. There is a myriad of flavours but my favourite is the taro milk tea (in the Philippines, I used to have mine with taro pudding which is basically taro jelly). And since most of the bubble tea bars are in London, I had to find a way to satisfy my craving. It wouldn’t have been financially responsible to run down to London everytime I had a bubble tea craving. So I bought taro milk tea powder, the straws, oolong tea and the tapioca pearls. The taro milk tea powder comes in 1kg bags so after a few sessions of taro milk tea indulging, I still had more than half a bag of the taro powder! 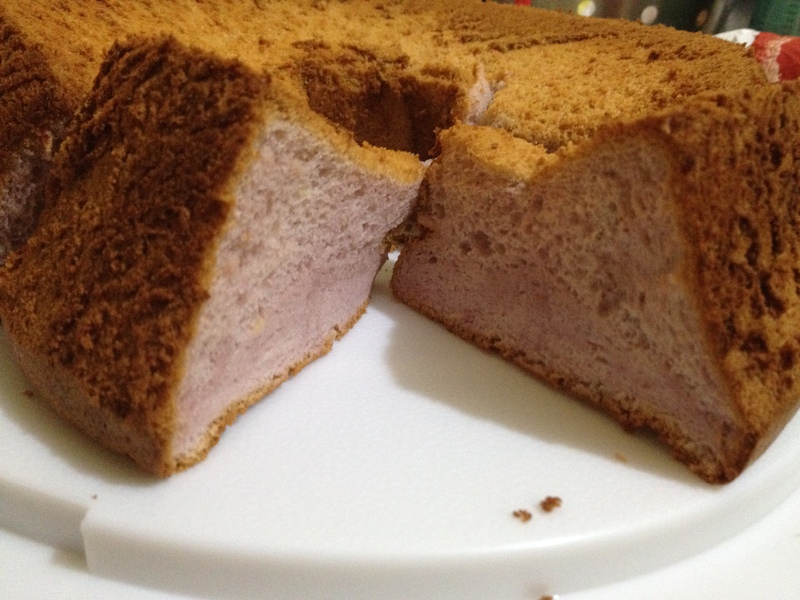 So I had the brainwave of making a taro-flavoured chiffon cake. It was all an experiment so I wasn’t sure it would work. 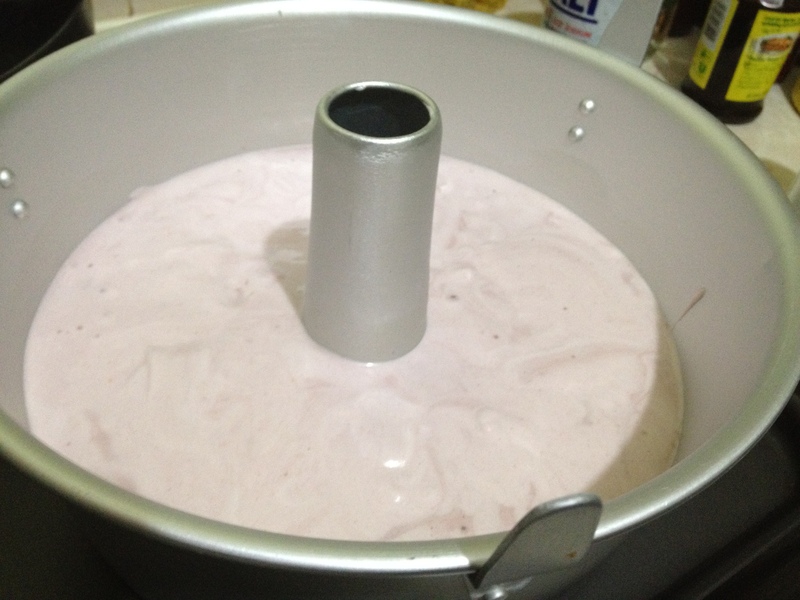 After the mixture was put together and I put it in the angel food cake pan, I looked at it with a lot of trepidation! The colour wasn’t as deep as I wanted it to be so I was VERY worried! But after the baking time, it came out and it was quite the yummy and light little thing. It’s still a bit unstable (probably owing to underbeating the egg whites!) and I want a deeper taro flavour, but it was a good start. What surprised me most is how the colour deepened as the cake baked! I’m looking forward to tweaking the recipe and having it come out all lovely and lilac! Previous PostCareful is as careful does! Where did you buy the taro powder in London?